**Update (1/20/17) : The original data set had a date formatting snafu resulting in 1307 tweets at the 12:00-12:59 PM (UTC time) hour to be displayed as 00:00-00:59 (aka 12 AM hour). This affected 4.3% of the original data set visualization and has been corrected. I have also added a footnote denoting the visualization is in EST. This affects the shape of the data in both the 4 AM – 8 AM and 4 PM – 8 PM sections. What’s interesting is that the actual article goes into significant depth on how their team systematically reviewed the tweets. It’a a bummer that the additional analysis done couldn’t be synthesized into visual form. Two things stuck out to me with the data. First: the username being retweeted wasn’t included; second: the entire tweet text was included. Having full text available just screams for some sort of text analysis. I got committed at that point to doing something with the text. So instead of doing sentiment analysis, I decided to turn the data more into text mining for mentions and hashtags. I had done some fiddling with the time component and was digging how the cycle plot/horizon chart were playing out visually. So it seemed natural to continue on a progression of getting more details out of the bars and times of day. Note on the time: time is graciously parsed into correct format with the data. In looking at the original time, I am under the impression it was represented in GMT (+0000). To adjust for this, I added -5 hours to all of the parsed dates to put it in EST aka Trump time. So back to text mining. Post #data16 conference, a colleague of mine was recounting how to use regex to scrub through text. I walked away from his talk thinking I need to use that next time I have the opportunity. And what I love about it: NATIVE FUNCTION TO TABLEAU!! So this was making me sing. Now I don’t know a ton about regex (lots of notation I have yet to memorize), so I decided to quickly google my way to getting the user handles and hashtags. These handy results really made this analysis zip along: regexr & regex+twitter. Everything else came to life pretty quickly. I knew I wanted to include at least one or two tweets to read through, but I wanted to keep it curated. I think this was accomplished well and I spent a good deal of time trying out different time combinations just to see what would bubble to the surface. A final note on aesthetics this week: I’m reading Alberto Cairo’s The Functional Art, and as I mentioned in an earlier post, I’m also participating in his MOOC that starts tomorrow. I am only 4 chapters in, but Alberto has me taking a few things to heart. I don’t think it is by coincidence that I decided to push the beauty side of things. I always strive for elegance, but I strive for it through white space and keeping that “data ink ratio” at a certain point. But I’m not blind to the different visualizations out there that attract people. So for once I used a non-white background (yay!). And I also went for a font that’s well outside of the look of my usual vizzing font. More than focusing on aesthetics, is of course the function of the viz. I tried to spend more time thinking about the audience and what they were going to “get” out of it. 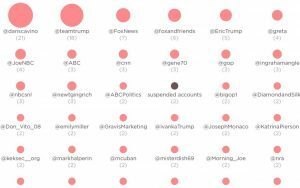 I hope that the final product is less of a “visual aid” to my analysis and more of an interactive tool to explore the tweets of the soon to be President. Full viz available on my Tableau public page.